These MUV+ soft-closing undermount drawer slides feature a redesigned pivoting latch that increases sound dampening for a quieter close. adjustment capability that’s expected in fine residential or commercial cabinetry construction. NOTE: Drawers must built to accommodate slides as detailed in product specs. 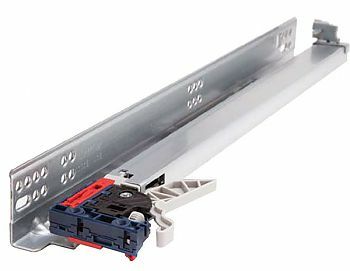 Fit the same drawer size and can be a "drop-in" replacement for the Blum Tandem Slides. Note: This product is also known as KVM-MUVB22 on other websites. Recommended Use: designed for kitchen cabinets, bathroom vanities, desks and furniture. Mounting: Concealed, undermount; For face frame & frameless applications with rear mount brackets (sold separately). Material:For up to 16 mm [5/8”] drawer panel thickness. 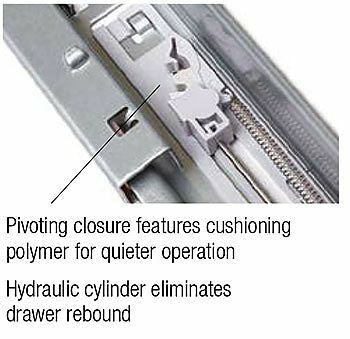 Hydraulic soft-close cylinder eliminates drawer "bounce back".